This page shows you over 50 of the most commonly asked questions from our customers (and the answers!). Click on a tab below. Do you install the kitchen? Are your cabinets supplied flat-pack? Are your cabinets made to measure? Can I have a cutlery insert in a drawer? What door catch options do you offer? Can I box in my boiler? What plinth styles do you offer? How are your doors made? What cornice styles do you offer? What drawer styles do you offer? No, we supply them unfinished so that you can paint, wax, oil, stain or varnish them. For the best paint finish kitchens should always be painted after installation. You will find that all the top kitchen makers like Smallbone and Mark Wilkinson do this. Be wary of any company who sells pre painted kitchens, you cannot see what they have covered up, and you will probably have to repaint after installation anyway where cabinets have been joined for example, and you may find it hard to match the paint colour as paint is made in batches. Also be aware of anyone who paints the insides of the cabinets, especially the drawers, as they will become scratched very quickly. Many of our customers paint their own kitchen, but local painters are always available if you need someone else to do it for you. Either from solid wood, or a mix of solid wood and real wood veneer. You can see the various specifications on our Downloads page. No, we are supply only. Some customers save money by installing the kitchen themselves as the cabinets are supplied fully built with doors, drawers, and all internals like bins fully installed. In addition our cabinet sides are finished so you don’t need separate and expensive end panels. Depending on where you live we may be able to suggest a fitter, but if not, you will be able to find fitters locally. Nearly all fitters are self employed even those who work for companies like John Lewis and B&Q, and some won’t be registered for VAT and so could work out cheaper. Yes, we have 2 showrooms. Please see our contact us page for details. We can help you with your design in an number of ways. Please see our Designing Your Kitchen page. Yes, we deliver to the whole of the mainland UK. See our Delivery FAQ for more details. All of our kitchens are "in-frame", that is the doors and drawers sit in a frame on the front of the cabinet. The other type is the overlay kitchen, where the doors and drawer fronts sit directly on the front of the carcass, and there is no frame. Overlay tends to be a cheaper method of construction. Yes, subject to our min and max dimension limits. You can see pictures on our Door Style page. Yes, but the best solution depends on the location of your boiler. We can provide a door in a front frame, so that you can cover the front of the boiler, from a wall to another cupboard, or between 2 cupboards. we can supply a door in a front frame together with 1 or 2 cupboard sides to go around your boiler. The top and bottom of the cupboard are not usually supplied because of the need for ventilation. We offer 4 plinth styles, Planted, Framed, Framed 2, and Recessed.You can see pictures on our Door Styles page. How can I make my cabinets fit against uneven walls? doors are also 25mm thick, compared to the usual 18mm, this helps prevent them warping. We offer 4 cornice styles: Curved, Traditional, Flat and Double Flat. You can see pictures on our Door Styles page. We offer 3 drawer styles, 1, 2 and 3. You can see pictures on our door styles page. What hinge options do you offer? You can see pictures on our Door Styles page. We have 4 door styles, A, B, C and D. You can see pictures on our Door Styles page. I have a plan from another kitchen company, can you use it to quote? A £350 deposit secures your manufacturing and delivery slot. An additional £650 12 weeks before delivery at the start of the design process and the final balance in cleared funds 4 weeks before delivery. The deposit can be paid by cheque, credit card, debit card or bank transfer. No delivery will be made without cleared funds. Please note that to protect our employees we do not accept cash in the showrooms. Do your drawers have runners? Do your base cabinets have adjustable feet? Do your base cabinets have a service recess at the back? What height are your base cabinets? What depth are your base cabinets? Can you accommodate cut outs for pillars/pipes/etc? Do your base cabinets come with a shelf? What height is a Planted plinth? How are your drawers made? Yes, in common with some very expensive kitchen companies we use top quality soft close runners. The runners have soft close as standard, and are hidden under the drawer with a quick release mechanism for removing the drawer for cleaning. They also have a massive 40kg weight limit. Finally, the runners are easy to adjust if necessary during installation. Yes, normally 50mm, but as your cabinets are made to measure you can have any service recess you need (min 20mm), and the service recess can vary from cabinet to cabinet. Our standard is 870mm, and we recommend that you keep to this as far as possible to prevent potential problems with appliance sizes and property resale. We can do some base cabinets at any height between 400mm and 900mm for occasions where different heights cannot be avoided. Standard is 600mm, but as your cabinets are made to measure you can have any depth within our min and max limits.. Yes, just let us have the dimensions of the cut out required. Our drawers are made of 6 separate pieces. 4 pieces make up the drawer box, these are made of solid wood, and the drawer box is made by using traditional dovetail joints. The drawers are mounted on top quality soft close runners, and these runners are hidden underneath the drawer. The runners have quick release clips so the drawer can be removed for cleaning etc. They have a massive 40kg weight limit. The drawer runners come with soft close as standard. Do your cupboards have a recess underneath for lighting? Do your spice drawers have runners? What height are your wall cupboards? Why do your cupboards have a 20mm recess at the back? What depth are your wall cupboards? Yes, there is a 20mm recess underneath for lighting. We can also supply separate 40mm light pelmet if needed. So that the edges can be scribed to an uneven wall. Our standard is 350mm, but as you cupboards are made to measure, you can have any depth you need. How does your door fit onto my dishwasher door? Do you make a housing for an integrated dishwasher? Can you build around my US style fridge freezer? Can I put a fridge freezer against a wall? Can you make a housing for an integrated fridge freezer? Can you make an oven housing? Can I have my microwave in a wall unit? Can my tall oven housing go right up to the ceiling? What make of oven do I have to buy to fit your housing? Can I have a mid-height oven cabinet? Can I have a drawer under the oven in my single oven housing? Your dishwasher will come with a fixing kit. Your integrated dishwasher will sit on the floor and so doesn’t need a housing, however we make a door with its own cabinet front frame to fix to the dishwasher so that it matches the rest of the kitchen. Yes. Please see our gallery for some examples. 90mm wide, or tall larders with either chrome pull out mechanisms or adjustable shelves. The narrowest pull-out larder is 400mm wide. Another alternative is a single column width wine rack. To go between whatever you choose for the sides, and above the fridge freezer, you can choose a fridge top box (WALL007). Alternatively, you can have a wine rack (WALL010), or an open shelf unit (WALL015). not be able to remove shelves and drawers for cleaning, etc. Yes. We can make a housing for any make and model of integrated fridge freezer. You will need to allow 680mm width, even if your model is narrower. The item code is COOL001. Can you "hide" a freestanding microwave? Yes, you can have a single oven under the worktop, this is an OVEN001. For a double oven under the worktop, you don't need a housing as the larger ones sit on the floor, and the smaller ones sit on brackets attached to the cabinet each side. You can also have mid height oven housings for a single built in oven, a microwave, coffee machine or steam oven. We can supply tall oven housings for just about any combination of oven, microwave, coffee machine, etc. The oven housings can be supplied at 680mm wide. This will fit all standard integrated appliances and allow for our 40mm frame each side. Yes, if its an integrated microwave built specifically to go into a wall cupboard. They tend to be less deep so that they fit into a standard 300mm deep kitchen wall unit. This makes them smaller overall, and mostly, fairly basic. corner is more than the actual height). Please see our Downloads page for our appliance list. This lists all the popular appliances that will fit into standard apertures. For example the list for single ovens contains over 80 ovens. We can also make non-standard apertures if you have specific requirements. You can have a mid height oven housings for a single built in oven, a microwave, coffee machine or steam oven. Will I have to help unload? Will your truck get down my narrow lane? Do you deliver to my second floor flat? Standard Delivery. 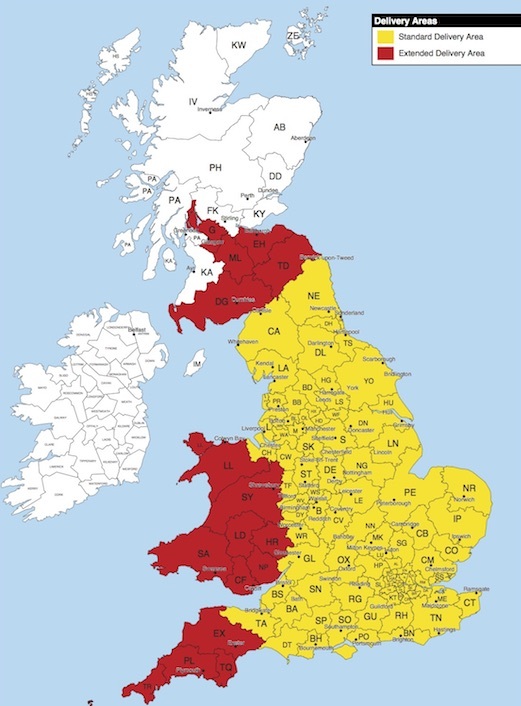 This is £350 to yellow areas of the map. For other destinations a quote will be provided. You will be given an approx date when we confirm the order. To enable us to charge these low amounts we need to deliver 2 or 3 kitchens at a time. Because we are combining 2 or 3 deliveries you cannot choose the day or time of delivery. If you need this facility please see our enhanced delivery below. If your kitchen needs to be delivered on its own because of site access restrictions, (ie; our usual truck is too big to get to your property to unload) you will be charged as per the enhanced delivery service below. Enhanced Delivery. This is £495 to the yellow areas of the map. For other destinations a quote will be provided. You will be given an approx date when we confirm the order. We will then call you before delivery to agree a date and an am/pm slot. This option gives you more flexibility to decide the delivery date and an AM/PM time slot (subject to availability). Extended Delivery Area. We have fewer deliveries to these areas, and so usually cannot combine deliveries. This means we will will quote you for delivery based on your distance from our Workshop. We deliver to the whole of the mainland UK. Please contact us for details of deliveries to France, Spain, and the rest of Europe. No, we always have our own experienced 2 man delivery team. As a guide, our normal delivery truck is a large luton van size, if you need a smaller truck/van, then our enhanced delivery terms will apply. Due to insurance restrictions we are only able to deliver to the ground floor.